Note: I think it is preferable to come off the top of the stove if performance is more important than aesthetics: the stove may leak smoke from its open door (whilst lighting) until the fire is established and the chimney warmed. This is not a problem to get too hooked up on because as soon as the fire is established all is well. It just means that you cannot spend much time “faffing around with the door open” when the chimney is cold. And this method is very neat and tidy aesthetically. 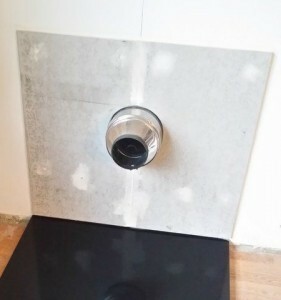 Hole in wall obscured by 6mm or 12mm Hardiebacker board created in two halves (can be painted with emulsion). Decorator’s Caulking used to fill gaps and obscure countersunk Thunderbolt heads. When filling gaps gouge a “valley” for Decorator’s caulking to grip. Use a credit card or similar to apply Decorator’s Caulking. Hearth in this case is slate dropped onto a thin bed of mortar. Twin wall stove connector was a little loose in stove collar so I added some self adhesive fireproof webbing. 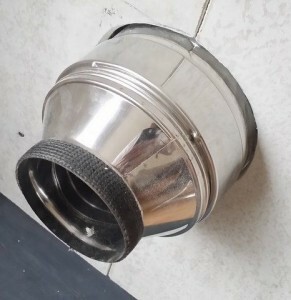 When I slid the stove onto the connector I added one self tapping screw that passed through the stove collar and through the webbing and snout (so stove could not slip off of chimney). In this picture you can see the “valley” for the Decorator’s Caulking mentioned underneath the previous picture. 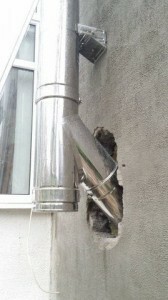 Hole in wall for twin wall flue to pass through. Hole filled with Rockwool (not normal insulation MUST be Rockwool). Decorator’s Caulking coming in useful again. 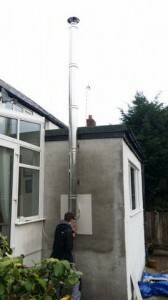 Note height of finished chimney. 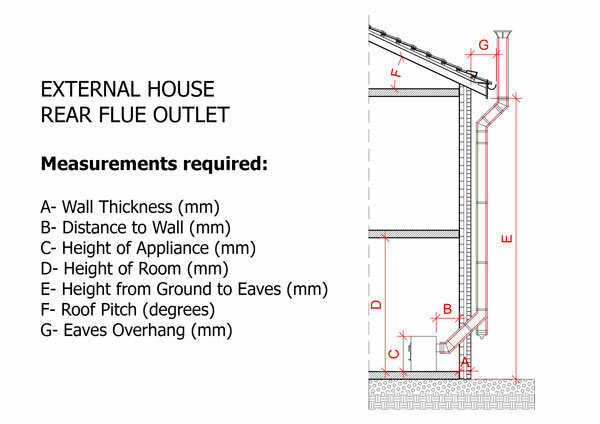 We are at 4.5m above stove as recommended by Building Regulations. The top bracket is as close to the top of the building as possible and we have approx. 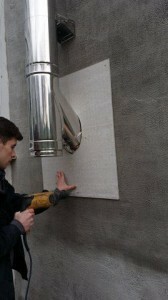 2.4m unsupported flue (close to the max. recommended 2.5m for this brand. 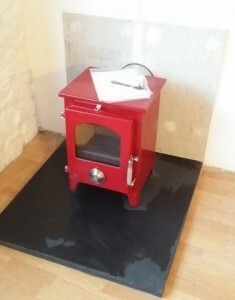 Stove fitted is a Newton 5 enamel in claret. 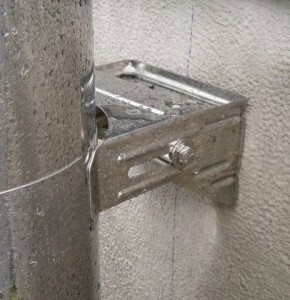 One of the brackets used to connect the flue to the wall. 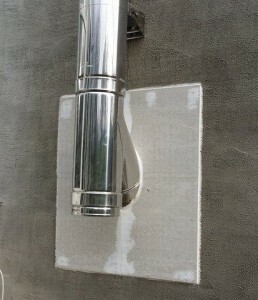 It is best to fit the bracket to the wall first and the pipe later. Note the blue spirit level line used to mark where the middle of each bracket should be placed. 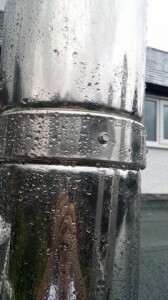 When I have two or more metres of frestanding flue I add some self tapping chunky screws to the joint between the flue pipes for added security (I drill holes with a strengthened 4mm drill bit and then add the self tappers).